Though these words were uttered toward the end of a panel on economic development at the Woodlawn Community Summit, they came not from a Woodlawn resident, or even a “neighbor,” (as the Hyde Parkers in the room coyly referred to themselves). They came from a Jewel-Osco driver who had stopped into the Summit before 8am that morning to drop off some food, and found himself so charmed that he decided to stick around for the duration. He came from a suburb, he explained, “where we can’t even agree to take away matches from the guy who’s threatening to commit arson,” so discovering a building full of civically committed neighbors was, to say the least, refreshing. Despite the driver’s focus on the grassroots enthusiasm evident at the summit, it was paired with a slick corporate and political presence, as the driver was also sitting right next to a Jewel-Osco community relations manager who was there to represent the new grocery store opening at 61st and Cottage Grove in 2019. 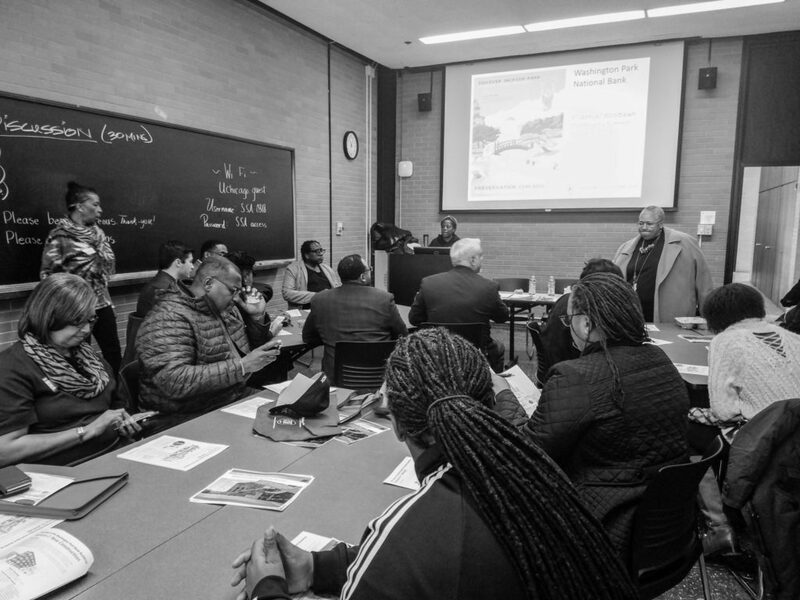 A variety of guests and speakers—a doctor at the University of Chicago’s new trauma center, a representative from the Obama Foundation, a wealth of local officeholders and candidates—joined together with longstanding activists in Woodlawn to discuss what the neighborhood’s trajectory over the next few years might look like. The summit is now in its ninth year and has grown from occupying a single room provided by the the UofC’s Office of Civic Engagement to the entire Social Service Administration building on UofC’s campus. In addition to being a venue where large institutions like the UofC and the Obama Foundation can be held accountable to Woodlawn residents, the summit aims to be a locus of information and dialogue, with features such as a resource fair, tabled by neighborhood organizations dispensing news and contact information, and workshops on topics like urban gardens and tips for homeowners. In that spirit, the summit emphasized the importance of fostering and supporting small businesses, particularly given a lingering suspicion toward bigger corporations—such as ones like Jewel-Osco that are purchasing land in the neighborhood—that community members have no stake in. “A lot of the businesses that you bringing in, we don’t own the property, we don’t own the business…We have to keep our ownership in the community, so that these businesses can rent from us,” said Sandra Bivens, one of the organizers of the summit. Still, it wasn’t always clear who in the community will benefit from economic development unfolding in Woodlawn. At the Q&A portion of the event, one resident asked Michael Strautmanis, vice president of civic engagement at the Obama Foundation, about displacement, which the resident said would inevitably take place with the arrival of the presidential center in Jackson Park. In his response, Strautmanis rejected that idea, precisely by invoking the idea that Woodlawn residents should take responsibility for themselves and their neighborhood: “If you think displacement is inevitable, you will create a mindset where we give up,” he said. “What will prevent displacement is empowerment. We are bringing the resources, and this community has to set a standard for what has to happen.” Strautmanis also noted that developers should be encouraged to maintain their stock of affordable housing, and that the Chicago Housing Authority (CHA) is looking to build more affordable housing in the area. Later, at a workshop specifically on the topic of economic development, a similar tension surfaced. Andrea Zopp, CEO of World Business Chicago (WBC)—the city’s public-private economic development corporation—told the room that WBC had been reorienting itself around local neighborhood development, and cited several intersections on the South Side that she thinks are examples of the right kind of growth. One location Zopp praised was the stretch of Cottage Grove from 61st to 63rd, where a plethora of developments have taken place over the last few years. After-school program MetroSquash relocated to 61st and Cottage Grove in 2015, and the organization Preservation of Affordable Housing (POAH) has built or renovated 800 units of housing over the past several years, much of it affordable, and has brought Jewel-Osco to the area that will open in 2019. POAH is also working on Woodlawn Station, a mixed-use building that will provide another seventy units on the corner of 63rd and Cottage Grove. Meanwhile, the Cook County Land Bank Authority is spearheading the redevelopment of the abandoned Washington Park National Bank Building, and the city is renovating the Cottage Grove Green Line stop. Zopp’s and Strautmanis’s answers, despite gesturing toward a concern for residents in danger of being priced out of the neighborhood, nevertheless suggest that neither the city nor the Obama Foundation have crafted particularly concrete plans to ensure that Woodlawn’s supply of affordable housing—the creation of which is often a painful, protracted process—will be enough to protect the neighborhood’s most vulnerable. But an alternate history of Oakenwald suggests that those options aren’t always available to everybody living in a swiftly developing area. In a 1996 article published in Residents’ Journal, a newspaper by and for public housing tenants, Izora Davis wrote a “partial history” of Lakefront Properties, the public housing development that included the buildings on Oakenwald Avenue Spann Cooper referenced in her speech. Davis recounts how the CHA twice attempted—once in 1985, and then again in 1991—to force residents to move out of the buildings so that they would be demolished and replaced by mixed-income housing. “The heat was turned off. Elevators wouldn’t work. Electricity was also turned off after a point. Water froze the stairwells. Pipes were busted and electrical meters were stolen,” she wrote. Two of the towers were renovated and turned into Lake Parc Place, while the others were demolished and replaced by Sullivan Station; both are mixed-income developments. For reference, Sullivan Station contains forty-seven public housing units; the four high-rises it replaced contained 604 units. And as an investigation by the Weekly last year showed, the CHA has failed to replace most of the public housing units demolished as part of its nearly-two-decade-long Plan for Transformation. North Kenwood-Oakland’s past begs a question about Woodlawn’s future: How will the benefits and costs of its newfound popularity be distributed among the people currently living there? The answer is waiting to be worked out, but if there is any reason for optimism, it’s the sense of determined community engagement among the Woodlawn residents at the Community Summit. I am a member of 1Woodlawn, an organization of residents that are indeed involved in the redevelopment process. We’re working on strategies to avoid displacement of current home owners and hold property taxes down for long time residents with fixed incomes. We certainly welcome the coming of the Obama Presidential Center and the jobs so many new businesses will provide. However, we realize that in order to benefit by all this renewal, we must have skilled workers and other professionals waiting in the wings. We’re working on that end. Land ownership is also in the conversation We are definitely not standing on the sidelines. Keep on fighting ! The city’s only answer for its residents of color is displacement.